The LitRejections Short Story Prize is now open for entries in 2019. You will be asked to upload your submission during the payment process. Please make a note of your order number for any correspondence. 2nd Prize: $50 and promoted on our social media. 3rd Prize: Free Chapters and Query Critique, along with promotion on our social media. 1. Closing date for entries is 8th July 2019 at midnight (EST). 3. The maximum length of submissions is 2,000 words, but there is no minimum length. 4. Stories can be can of any genre, but must focus on a central theme of rejection. 5. 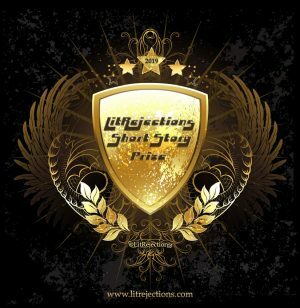 The LitRejections Short Story Prize is open to all published and unpublished writers. There is no geographical restriction on entry. 6. Writers may format their work in the way they feel is most appropriate. 7. Please include your name and contact details on your submission. 8. Entries must be entirely the work of the entrant and must never have been previously published, in print or online (including self-published, magazines, journals, websites, blogs, social network sites), or broadcast or won a prize in another writing competition. Any entry found to have been plagiarized will be disqualified. Simultaneous submissions are welcome – but please let us know as soon as possible if a story is to be published elsewhere or has won a prize in another writing competition. 9. All entrants must agree to have their work published on the LitRejections.com website for a period of 1 year. However, the writer will be free to remove their story from the site at any stage during this year if they wish to. Authors will retain worldwide copyright on their work (including film and dramatic rights) but LitRejections has first publication rights to publish the shortlisted stories in both print and ebook formats should they choose to. 10. LitRejections will not comment on individual stories or give feedback on individual stories. 11. The LitRejections Short Story Prize Longlist will be announced on the LitRejections.com website on 2nd September 2019 at 2pm (EST) and the LitRejections Short Story Prize Top 3 Prize Winners will be posted on the LitRejections.com website on 16th September 2019 at 2pm (EST). 12. The winning Short Story will be announced on all of the LitRejections platforms on 23rd September 2019 at 2pm (EST). 13. Entry implies an acceptance of all the LitRejections Short Story Prize rules. Entries that fail to comply with the entry rules and requirements may be disqualified.